One of the ways I like to improve on my technique is through the use of tools, so every year I add something new to my makeup toolbox. 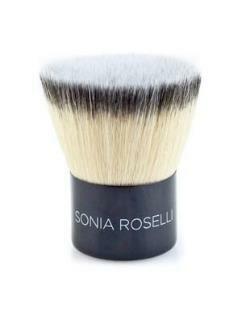 My newest addition is the stipple foundation brush by Sonia Roselli. This brush is similar to the Kabuki brush used for applying bronzer, but is smaller and designed for the application of foundation. The synthetic nylon hairs have a very soft silky feeling that's softer than some high grade natural hair which make achieving an airbrushed look effortless. This product can be used with any product whether emollient (wet) or mineral based (dry). To create the airbrushed look apply your foundation with a stippling application. Stippling is a technique of pat and roll. This technique helps alleviate noticeable brush strokes in your foundation. It gives better coverage in the areas where imperfections like redness and blemishes need more attention. Product price $48.00 Available at Sonia Roselli Studio.